Note: This version of FIFA 19 for PS4 may be available in several versions. In physical version, you will simply receive the game box at home. 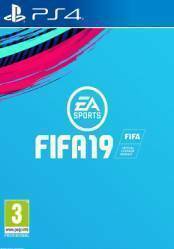 In the digital version of FIFA 19, it may be available in two different formats. On the one hand in the form of a code, which you must enter in your user account to download the game. Or in account format, you will receive a username and password for an account that already contains the game. Don't forget that digital versions of console games may have regional locks, so please pay attention to the download specifications in each store. Developed by the powerful Frostbite engine, FIFA 19 will provide the ultimate football experience. Among the novelties that are known, since the information available is still scarce, are the new improved game tools that will allow us to control the field of play at all times in a way never before seen in the franchise. New mechanics, new game modes, better control of the ball, new shooting system, unique personalities per player that will make them recognisable to the naked eye in the middle of matches, more emphasis will be placed on the ever popular FIFA Ultimate Team, and much more. So get ready for what is, like every year, the best-selling football game on all platforms. There are no comments yet about FIFA 19. You can be the first one! YOUR ULTIMATE TEAM - FIFA 19 IS FINALLY HERE!